Welcome To Bustini's Event Rentals Linen Page. 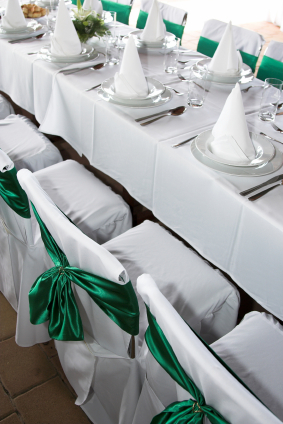 We offer a wide areange of tablecloths and we are located in Kingston , Ontario. With over 30 years’ experience serving the Kingston Region, We offer prompt quotes and competitive pricing. We service events such as weddings, trade shows, festivals, social events and much more. Our Kingston Table Rental payment options and plans. We accept all major credit cards. We offer tablecloths in various sizes and shapes. Spandex covers, for cruiser/cocktail tables, can quickly enhance the look and feel of your special event. We have all the table accessories such as table number holders, breadbaskets, water pitchers and much more. We offer tablecloths for round and rectangular that our durable, heavy duty, that will more than cover your needs, all in elegant and tasteful styles. Our standard linens come in a selection of sizes to suit any size table, from an intimate small arrangement to a larger setting for the whole party. Pick from our loose hanging tablecloths styles as well as fitted spandex tablecloths. • Universal for six and eight foot tables. • Drapes standard 6 & 8 foot table to the floor. • store un used items underneath tables. • creates a stunning look for decor tables. • offered at a great rate on our website. • Drapes any table to the floor. • only available for 6' and 8' tables.